The organization of the Free Swords, wich our hero is a member, is a dreaded group of mercenaries. In one of our last works for some clients of the organization, a hateful undeaddisturb the ritual and something unexpected and horrible occurs, our hero just literally possessed by a demon of fire. But this does not end here , then we began to notice how the power of the devil is within us, but such power, in case you decide to use it , has a very high cost that will consume our own humanity . 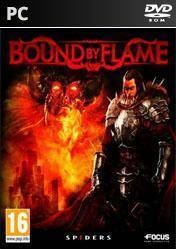 Bound by Flame is an RPG set in a fantasy world, where you control a character who has been possessed by a demon of fire. Because possession afflicting our hero, we choose from the demonic power that runs through our veins and our own humanity. If we choose the hard way , you must reject the infernal influence and develop the true skills of a hero, but human nature after all . As you face your enemies and terrifying dangers will be a growing temptation to give the devil within us in exchange for more power ... and when you do it our heroe will change forever. There are no comments yet about Bound by Flame. You can be the first one!